Even starting with the pack this year, I was quickly alone running along the trail. I was running at my “expected” pace, but I was huffing and puffing more – my asthma flaring? allergies? I’m not sure, but I felt more like a sturdy mule doggedly pounding down the trail instead of a fleet jack rabbit. Less than a mile in I saw Stashi tied to a tree. Last year at my first mount I almost lost my balance while mounting and got my stirrup caught on my foot and came the closest I’ve ever gotten to being able to visusalize being dragged…..the adrenaline of running and the excitement of the race start really revs the ole’ sympathetic autonomic nervous system and can make that first mount fairly exciting!!!!! So, I took a deep breath, walked up to Stashi, and smoothly mounted. Success!!!!!!!!! In fact this year, I didn’t have any problems mounting and dismounting. I’m giving credit to all the running I did during endurance this year! No sprained ankles, no close calls – just smooth balanced mounts from both sides of the horse both on and off trail. Soon my Dear Reader. Soon. Now, at endurance rides I ride my own ride and I’m happy with a smoothly executed ride with minimal problems. In the one and only fiddle contest I competed in (pre blogging thank goodness, so you’all weren’t subjected to *that* particular sound clip) My goal was to get on stage, get through my three pieces with a reasonable degree of competence and gracefully exit stage left. Not exactly the most competitive goals. But somehow…..if it involves running…..cue “EYE OF THE TIGER” and by God just TRY AND PASS ME IN THE LAST HALF OF THE RACE YOU SUCKER!!!!!!!!!!!!! You know….just enough competitive spirit to make things….fun. BAWHAHAHAHAHAHAHA!!!!!! I had previously scoped out our competition pre-race. I didn’t recognize anyone from the previous year, and everyone I had asked was doing a different course (there were 6 races going on simultaneously). Then, about 15 minutes pre start I saw a couple that had done the short course last year and who had just nearly beat me, Michele, and Stashi. In fact, we had wondered at the time if we had known that they were doing the same race if we could have improved our placing by just going a *little* bit harder. So, I sauntered over to say hi. And inquire about the course they were doing (the same one we were doing!). And then I learned a juicy piece of information. They were riding their *backup horse*. Maybe it wouldn’t matter that they moved down the trail like a well oiled three piece machine on their sinewy-obviously-run-regularly-and-definitely-live-where-there-are-hills legs. This year we would edge them out for a victory. Note to the riders who may very well recognize yourself in this story: you guys were awesome and provide my team much fun and motivation over the duration of the course :). I hope to see you at the next event, and I hope you have a good laugh over the story that was unfolding around you on the trail. After a couple of ties, Michele and I started to try and catch the appy team in earnest. At one point this resulted in a long stretch of me running while she galloped Stashi up the trail trying to make time. I’m the faster runner and at that point the course was still fairly flat, so it was a reasonable strategy. Except for the fact that at one point I started to wonder whether I had missed Stashi in the bushes and me and Michele were BOTH on the ground running with Stashi somewhere behind BOTH of us. I already had a sinking feeling who got to run backwards and find the horse. Me. For a lot of reasons including the fact I knew I could run double digits if I needed to and still finish the course. Oh the blessed relief of seeing the grey horse on the hill tied to a tree. I galloped up to Michele and confirmed that yes and indeed we were right on the heels of that appy. After over 30 min of being in a bubble by ourselves, we were making time. At that point the course started to go down hill. Now, my race plan was based on my experience last year. Last year, I was too reserved in the beginning of the race and had more to give at the end. This year the plan was to run every minute close to the maximum of my ability. This strategy worked perfectly for the first flat portion of the course, and combined with the efforts of Michele and Stashi, resulted in us and the appy team being neck and neck. I knew I was screwed when we started to go down, down, down……and yet more down. The course may be 2 miles shorter than last year, but had a feeling maybe my “give it all” strategy wasn’t going to work this year. I hold this truth to be self evident: What goes down down down, must come up up up, if the start and finish are in the same spot. Now, for all of his exceptional qualities as a ride and tie horse, moving down hill at a high rate of speed is not one of Stashi’s and I watched the appy moving further ahead. But not *too* far ahead. I had watched that appy move up hill and even though Michele and I did dismal impressions of “real” runners as we “ran” up the hills, Stashi can do a wonderfully balanced canter up hill, and because of the ties and being able to rest, can make REALLY good time up hill. So I knew if I kept that appy in sight, we were still in the running. At the aid station I ditched my helmet, knowing both that it was 5 years old and so if I didn’t get it back, due to be discarded anyways, AND knowing that the orange mohawk on it made it very likely I would get it back. I ran like a speedy gazelle downhill, until I became the gazelle that was definately lion’s lunch because clumsy gazelle’s don’t get to live and reproduce. While moving off trail for the appy and rider to pass me (darn it!) I caught my toe on a rock and fell (DARN IT!) with one of those hard, fast falls where one moment you are a 2 legged creature and the next you are a blob on the ground. I did manage time for one small wimper as I landed on outstretched hand, skidding downhill on palm and knee for about 4 feet, facedown, downhill. ***It is with this statement that you can tell I have lost my ability to think and communicate like a normal human being. Well, continuing on. Did I mention it really hurt? Like way out of proportion to the small amount of damage? Michele rides past me and I whine for a bit and she leaves me to continue down the hill. The down down down levels out on a hard packed road and I can see in the distance a hill that goes up up up. Like up for MILES. I can see Stashi catching up to the rider on the appy and I *almost* caught up to the second runner from the appy team. I decide to make friendly conversation. I don’t know if she remembers I doing the same race. I don’t know if she knows that me and Michele have made them our motivation to run our hearts out. And I don’t know if she has a competitive bone in her body. But, she’s a friendly face, and I’ve been doing a lot of this course by myself, and I have a HUGE hill in front of me that I’m trying to distract myself. So I start a light banter. This time I fell so fast and hard there wasn’t time to do anything except crunch into the rocky dirt at a high rate of speed. I sort of skid forward on my knee, hip, and face, embedding gravel into the palm of my OTHER hand on the way down. It hurt twice as bad as the first fall. It hurt bad enough that I decided I would do ANYTHING not to do that again. Including picking up my damn feet. You see, I haven’t been running very fast for very long. 99.99% of my training until the last 2 years has been all about running as efficiently as possible for as long as possible, mostly on roads. I’ve practicing the art of a very short stride with my feet moving as close to the ground as possible. Which is efficient until that said road runner decides to run on rocky trails, and get tired and DOESN’T PICK UP HER FEET. I start up the hill. Michele has nicely tied Stashi to the base of the hill and I mount up and canter past her to tie. There isn’t much to tie to on this stretch, but I can’t make Michele climb that horrid hill all the way up. So I pick a little scrub brush that looks like it will do the trick. Stashi hasn’t been particularly hot during this ride, and sometimes as you get later into a ride, you can tie to less substantial things….. But you know how you can get a feeling sometimes? See the future sometimes? Like….I kept turning around everytime I heard a horse to see if it was Stashi+Michele or just Stashi. A Stashi with a particular look on his face that said “this is such a fun sport to do with or without a rider!”. It was a very content look. If you were wondering, the look on my face was NOT content. 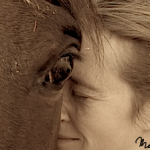 The look on my face said “I will catch this horse, and if I don’t, the amount of effort I put into this will be in evidence when Michele finds me on the trail bloody and unconsious. I calmly stepped in front of Stashi. He considered, and darted left. I firmly – without jerkiness, panic – just with immense resolve stepped to the side, once again blocking him. I stepped forward. Stashi begin to move like a cow horse in a fancy evasive manuever. I smoothly bent forward and grabbed the dangly tie rope. I squashed the urge to remount and gallop up this miserable hill and instead walked 20 feet to a nice sturdy mazanita bush, where I tied him for Michele. A couple more ties went by (in RnT I measure time in ties, not miles) and the trail was just up up and more up. The appy was long gone, less than a minute away, but it might have been a bazzilion times that based on the chances our team was going to get ahead of them. Michele and I had both agreed that we were both going to walk hills that were steep and I resolutely tromped my way up this massive thing. I tried to decide whether my ignorance about the total amount of hill still to go was bliss, or whether when I have to go up that hill again in 2 weeks as part of my trail half marathon, whether I’ll be more or less miserable, being more informed exactly what’s ahead. 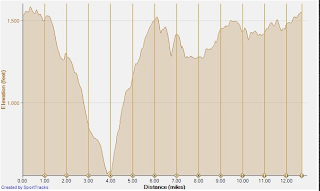 Because I’m pretty sure the hill I did for the ride and tie is the one that is pictured here in this elevation map as part of the 1/2 marathon course. At one point I saw a guy in front of me. An older guy. Which isn’t that surprising. If you’ve done any running at all, it’s the white haired older gentleman +/- beard that pass you at blistering speed. But, as I got closer I recognized him as someone I had heard about in the sport that was still doing this after a double(?) hip replacement. And I watched as he would run a couple steps up the hill, and then walk for a while, and then run a couple more steps. I decided if he could do it, I could. I ran for the count of 10, and then walked again – probably to the count of 30 or 40. And the ran for a count of 10 again. In my wildest dreams I can’t actually imagine running UP a hill. It’s just too hard and I’m too wimpy. But as I continued with this weird semi interval thing, I wondered if this is how people train to actually run up hills eventually? You just do a couple steps at a time and just keep repeating? Eventually we made it to the top. The 1 1/2 hour mark passed. 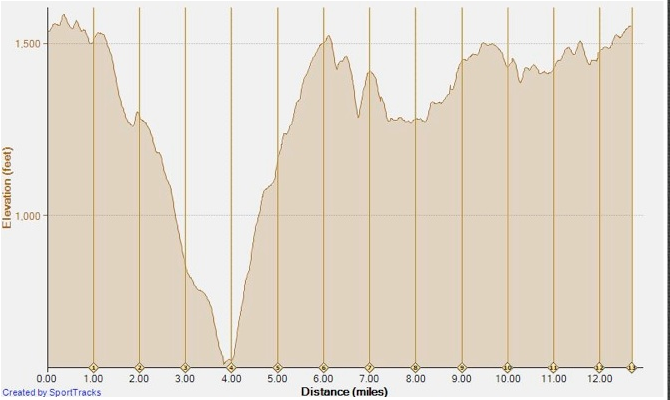 When I had heard that the 14 mile course was actually a 12 mile course, I had thought we might be done at that point, but that’s BEFORE I had to climb that giant hill. So I thought 2 hours was more realistic. I knew we had to almost be there, but I was having trouble even with the flats now. I managed to plod along and Michele and I traded off a couple of times, both of us pretty beat, but managing to stick to our plan of running the flats and downhills and Stashi was still cantering along. Finally the 2 hour mark was approaching. I was running on flat ground. I was tired. I didn’t know how far behind me Michele was. I really wanted to walk…but it was flat. So, on the pretense of getting a drink of water I slowed to a walk to gulp some water and OF COURSE THAT’S WHEN STASHI AND MICHELE COME THUNDERING DOWN THE TRAIL. I jumped like a startled rabbit, totally caught red-handed walking on the flat. LOL. Stashi and I rode down the trail. We were so close and Stashi was pulling to go home. I passed the “1/4 mile” sign to the finish at blistering speed and started looking for a place to tie. Michele was way too far behind me to catch up and Stashi was moving fast, so the logical thing to do (if tying your horse to a tree and running around is EVER logical) was to tie Stashi at some point in that 1/4 mile and run towards the finish line. Hopefully Michele got to Stashi and was able to gallop towards the finish line, catching up to me just as *I* was passing the finish line and we all get to go across the finish line together, hand-in-hand. That was the theory at least. And I’m proud to say that after the laughable attempt last year where we did NOT pull this off……this year we got it dang near perfect. I rounded a corner and saw the finish line. I started jogging backwards looking for Stashi to come up. It was probably the longest 30 seconds of my life until Stashi appeared. Michele, not sure whether I had remembered the finish line ritual rode in screaming for me to wait and I’m trying to reassure her I remembered and then we grabbed hands and smiled for Pronto who was taking pictures while I tried to not trip and fall in the rutted trail a THIRD time. And then we pulsed down and finished, less than 2 minutes behind the appy team. A 3rd place finish (out of 4) in 1:59. And started immediately making a plan for championships next summer :). That was riveting! I understand endurance so much better. I hope your wounds are healing. Who knew running can be more dangerous than riding? I know! Really?????? Last year it was the mounting and dismounting that tried to kill me. i was a little unprepared for my tripping. The weird thing was that I didn’t have any close calls – just those 2 really bad falls and the rest of the time not a bad step or trip or anything???? On the horse is always safer than off! They have more legs not to fall off of. 😀 Congrats on your mighty effort! This was a fun read.